Scott Air Force Base Dormitory - St. Louis Engineering Firm | Thouvenot, Wade & Moerchen | TWM, Inc.
TWM, a St. Louis civil engineering firm, has completed various projects for SAFB over the years. 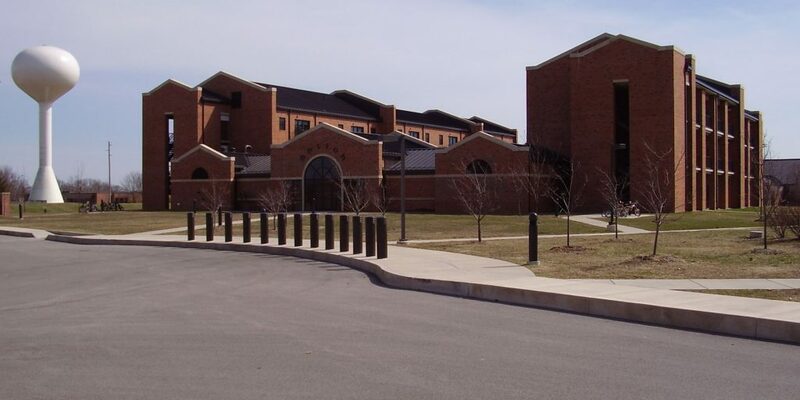 For this project we provided civil site design and land surveying for the new Shiloh Hall Dormitory and associated roadway, sidewalk, and parking lot. The firm’s scope included topographic survey; civil design analysis and calculations including domestic and fire water, sanitary sewer, storm sewer, grading and paving, and erosion control plan; applications for permits and reviews; record survey and drawings; and construction staking. The widening of Ward Drive required installation of a traffic signal, wheelchair ramps, and sidewalk improvements. All design elements incorporated anti-terrorism/force protection measures to inhibit the use of a vehicle to carry out an attack on the facility.